If the idea of a co-op story mode in Lost Planet 2 is not already enough for your brain pan, then a new trailer from Capcom and news about the release date may just cause your skull to explode like a headshot from a Longshot sniper rifle. 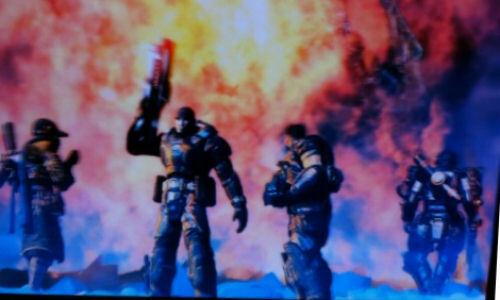 The latest trailer suggests that the stars of Gears of War 2 may be making a cameo in Capcom’s alien opus. I always felt that the first game had a distinct lack of overly muscular space marines with potty mouths. The rumours are as yet unconfirmed, but Cliff Bleszinksi (he will always be Cliffy B to me) has hinted that some big news is coming up, and the ability to recreate the bromance between Marcus and Dom in Lost Planet 2 falls under this remit. With Gears of War being a 360 exclusive, it is likely that the COGs will be downloadable content for Microsoft only and that they will be playable in versus, but not in the story. A video should be available on Xbox Live soon which showcases the trailer and more information about the crossover. The release dates have also just been announced with North America and Europe getting the game on the 18th May and Japan on the 20th. Page created in 0.3445 seconds.